Favorite ice cream spots around town are plentiful. What 'cha waiting for? 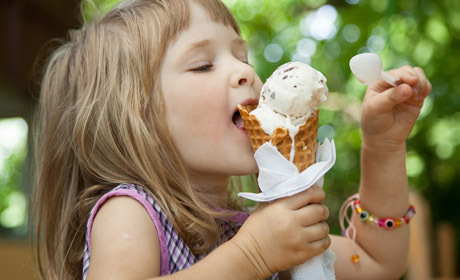 Summer's in full swing, and kids love ice cream and other frozen goodies?! Here's a collection of our favorite specialty spots for cool goodness on hot days around Middle Tennessee. Ben & Jerry's 416-A 21st Ave. S., Ste. A, Nashville 615-321-2478 Have your Ben & Jerry's the way it was intended — scooped fresh right in front of you! New flavors include Truffle Kerfluffle, Frozen Flakes, Bob Marley's One Love and Chocolate Cherry Garcia. Bobbie’s Dairy Dip 5301 Charlotte Ave., Nashville 615-463-8088 Since 1951, Bobbie’s Dairy Dip has been a West Nashville favorite. The building maintains its nostalgic feel, and it’s the best place in town for a classic soft-serve dip cone. Specialty shakes are a hit. Elliston Place Soda Shop 2111 Elliston Place, Nashville 615-327-1090 Step into this retro classic soda shop — it’s been in town since 1939 — on a hot day to sit at the counter for an old-fashioned banana split or a signature malt (try the butterscotch). The Dreamsicle Shake (orange sherbet, orange juice and vanilla ice cream) is a tried-and-true favorite. Jeni’s Splendid Ice Creams 1892 Eastland Ave., East Nashville 615-262-8611 — and — 2312 12th Ave. S., Nashville 615-292-7794 — and — 900 Rosa L. Parks Blvd., Nashville 615-928-8028 — and — 1819 21st Ave. S., Nashville 615-292-8636 Impeccable, friendly service and a hip atmosphere make eating the smoothest ice cream found anywhere all the more fun. No synthetic ingredients here; the all-natural, buttercream-based frozen treats include ice cream and sorbets. La Michuacana Premium 3763 Nolensville Pike, Nashville 615-416-9409 This Mexican shop features paletas, ice cream and sorbet in every flavor you can imagine ... and then some! Las Paletas 2911 12th Ave. S., Nashville 615-386-2101 This gem in the 12th South District offers a variety of Mexican popsicles made on site with fresh ingredients including fruits, herbs, nuts, veggies and more. The line moves fast here even on a crowded day. Legato Gelato 1200 Villa Place #113, Nashville 615-530-3190 Choose from 36 featured Italian ice cream flavors like Snickerdoodle, Grape, Watermelon, Graham Cracker and more. Marble Slab Creamery/MaggieMoo’s 2817 West End Ave., Nashville 615-329-8020 — and — 533 Opry Mills Drive, Lebanon 615-649-0843 — and — 155 Legends Drive, Ste. E, Lebanon 615-630-9898 It’s the ultimate mash-up watching your favorite ice cream getting blended together with your favorite mix-ins on the marble slab right before your eyes! Mike’s Ice Cream 208 Broadway, Nashville 615-742-6453 Pop into this shop in the heart of Lower Broadway for handmade ice cream, fro-yo, ice-cream sodas and smoothies. Mom and Dad will like the frozen espresso and cappuccino drinks, too. Pied Piper Creamery 114 11th St., Nashville 615-227-4114 Pied Piper makes all it’s bold flavors on site — and there are more than 200 of ‘em! Twenty-four are available on any given day — 12 permanent flavors with 12 rotating ones. Trailer Trash is the signature — and most popular — choice. It’s vanilla ice cream chock full of Oreos, M&Ms, Snickers, Butterfinger, Twix, Nestle Crunch and Reese’s Pieces. Popular with kids is Smurfberry Crunch — a tart blue raspberry sorbet infused with Nerds candy. Heat seekers should try Some Like it Hot — chocolate ice cream with cinnamon and cayenne pepper (it’s bold and tasty!). Savannah's Candy Kitchen 310 Broadway, Nashville 615-313-9919 Head straight to the back of the shop to the ice cream counter boasting lots of traditional and unusual flavors. They also serve up gelato; the chocolate-hazelnut is a hit! The Soda Parlor 966 Woodland St., Nashville 615-678-7235 East Nashville's go-to place for cool ice cream sodas, sundaes and other treats. Sweet CeCe’s 4225 Harding Pike, Ste. 103, Nashville 615-383-1711 —and— 433 Opry Mills Drive, Nashville 615-649-0434 —and— 5545 Edmondson Pike, Nashville 615-457-1925 —and— 224 W. Main St., Ste. F, Lebanon 615-784-4567 Kids love building their own creations at this beloved fro-yo parlor where you pay by the weight of your creation. Myriad toppings include fresh fruit, candy, cereal, nuts and syrups. Locations opening soon in Hermitage and Mt. Juliet. Yogurt Mountain 5225 Old Hickory Blvd., Hermitage 615-871-7070 This self-service fro-yo shop features rotating flavors and more than 50 toppings. Kids go for flavors like Blue Cotton Candy, Candy Cane, Sour Green Apple and Sour Power Berry Blue. Fresko Pops & Eatery 132 St. Andrews. Drive, Murfreesboro 615-962-9494 The ‘Boro’s newest icy sweet spot scoops up ice cream that’s made in-house — Cookie Butter is the big hit here. Also popular: the tasty fresh fruit paletas (Mexican popsicles). Marble Slab Creamery/MaggieMoo’s 452 N. Thompson Lane, Murfreesboro 615-217-2443 It’s the ultimate mash-up watching your favorite ice cream getting blended together with your favorite mix-ins on the marble slab right before your eyes! Menchie’s Frozen Yogurt 440 Sam Ridley Pkwy., #120, Smyrna 615-984-4676 Select your fro-yo flavor then go to town adding toppings of your choice from fresh fruit to chopped nuts to assorted candies to breakfast cereal. Rita’s Italian Ice 2018 Medical Center Pkwy. Murfreesboro 615-217-4849 Smoother than a snow cone, refreshing flavors include Banana, Honeydew, Cherry, Raspberry and many more. Little ones are quick to go for unique flavors like Cotton Candy and Peanut Butter & Jelly. Rita’s also has six frozen custard flavors. The Soda Bar 500 Medical Center Pkwy., Ste. 1C, Murfreesboro 615-696-7923 Offers specialty ice creams, craft sodas, floats, Hawaiian shave ice, coffees and signature take-out treats such as edible cookie doughs. What’s different about them, however, is that there are 16 flavors of ice cream that you can pair with one of their 12 craft sodas on tap. Get a unique flavor every time you visit! Sweet CeCe’s 2615 Medical Center Pkwy., Ste. 2380, Murfreesboro 615-849-1060 Kids love building their own creations at this beloved fro-yo parlor where you pay by the weight of your creation. Myriad toppings include fresh fruit, candy, cereal, nuts and syrups. Top Cold Grill Ice Cream & Tea 2855 Medical Center Pkwy., Murfreesboro 615-295-2538 Delicious ice cream spread out over a cold top then scraped up into a roll and topped with just about anything. Yogurt House 2333 Memorial Blvd., Murfreesboro 615-956-6676 Find rolled ice cream and frozen yogurt, smoothies, milkshakes and slushies! They also have other food items. Marble Slab Creamery/MaggieMoo’s 200 N. Anderson Lane, Ste. 108, Hendersonville 615-824-4373 It’s the ultimate mash-up watching your favorite ice cream getting blended together with your favorite mix-ins on the marble slab right before your eyes! Sweet CeCe’s 162 E. Main St., Hendersonville 615-265-8014 Kids love building their own creations at this beloved fro-yo parlor where you pay by the weight of your creation. Myriad toppings include fresh fruit, candy, cereal, nuts and syrups. Bruster's Real Ice Cream 10646 Concord Road, Brentwood 615-819-0378 A wide selection of ice cream, frozen yogurt, ice, sherbet and sorbet flavors. Try banana chocolate chip! Cold Stone Creamery 782 Old Hickory Blvd., Brentwood 615-661-8876 Design your own creation that’s hand mixed on the giant granite slab. Popular options are Birthday Cake Remix and Strawberry Blonde — order your’s in a waffle bowl. Also try one of the shop’s tasty shakes, smoothies or frappes. The Comfy Cow 7011 Executive Center Drive Bldg. B, Ste. 105, Brentwood 615-645-5739 The Comfy Cow makes its flavors from scratch using regional ingredients. They’ve got the best chocolate malt in town, and there are 26 ice cream flavors on the menu — a handful of them change out monthly. The kid-favorite Cookie Monster Dough boasts big hunks of chocolate chip cookie dough combined with a cookie dough-based ice cream. Elliston Place Soda Shop Cool Springs 330 Mayfield Drive, Ste. A-5, Franklin 615-656-0045 Step into this retro classic soda shop — the Nashville location has been in town since 1939 — on a hot day to sit at the counter for an old-fashioned banana split or a signature malt (try the butterscotch). The Dreamsicle Shake (orange sherbet, orange juice and vanilla ice cream) is a tried-and-true favorite. Jeni’s Splendid Ice Creams 211 Franklin Road, Ste. 100, Brentwood 615-964-7611 Jeni's newest Middle Tennessee location just opened in Brentwood this summer! Enjoy ice cream and sorbets made from all-natural ingredients. Marble Slab Creamery/MaggieMoo’s 1800 Galleria Blvd., Franklin 615-764-0570 It’s the ultimate mash-up watching your favorite ice cream getting blended together with your favorite mix-ins on the marble slab right before your eyes! Nucci’s Gelato 600B Frazier Drive #100, Franklin 615-778-1542 Nucci’s exquisite gelato is made from all-natural ingredients sourced from local dairies and fruit from local growers. Choose from a variety of flavors; Cookies & Cream’s the most popular with kids. Rita’s Italian Ice 7171 Nolensville Pike, Nolensville 615-776-2100 Smoother than a snow cone, refreshing flavors include Banana, Honeydew, Cherry, Raspberry and many more. Little ones are quick to go for unique flavors like Cotton Candy and Peanut Butter & Jelly. Rita’s also has six frozen custard flavors. Sweet CeCe’s 269 Franklin Road, Ste. 200, Brentwood 615-760-5599 —and— 3020 Mallory Lane, Ste. 127, Franklin 615-472-8760 —and— 500 W. Main St., Franklin 615-807-1412 —and— 1005 Crossing Blvd., Spring Hill 931-489-6000 Kids love building their own creations at this beloved fro-yo parlor where you pay by the weight of your creation. Myriad toppings include fresh fruit, candy, cereal, nuts and syrups. Whit's Frozen Custard 4020 Hughes Crossing #100, Franklin 615-472-8774 Made fresh daily, Whit's offers three flavors: vanilla, chocolate and the weekly special. Upcoming specialty flavors include Peanut Butter Cookie Dough, Strawberry Vanilla Cookie, Lemon Drop and Caramel Pecan Pie.